Students preparing to enroll in graduate school have numerous admission requirements to meet during the application process. Many universities require multiple letters of recommendation, transcripts, essays, personal statements and application fees. Some schools also require standardized test scores like the GMAT or GRE. However, not all graduate schools consider these exams as a requirement. Hofstra Law’s Health Law and Policy programs don’t require test scores. Let’s take a closer look at what the GMAT and GRE are, why some universities require them and why they are not necessary for admission to Hofstra Law. According to the official website of the Graduate Management Admission Council, students use this test to measure and showcase the skills needed to complete graduate school. The GMAT was designed to predict the success rate and academic performance of students in the classroom. Some universities also use the test to understand students’ attitude and dedication toward their education and career. These universities consider time spent preparing for the GMAT as an indication that students are willing to work to benefit their career in the long run. Additionally, if a student’s academic performance was lacking during their undergraduate studies, they can use the GMAT score as a way to show that they have the necessary skills to complete graduate school. Much like the GMAT, some universities require the GRE for admission to a graduate program. 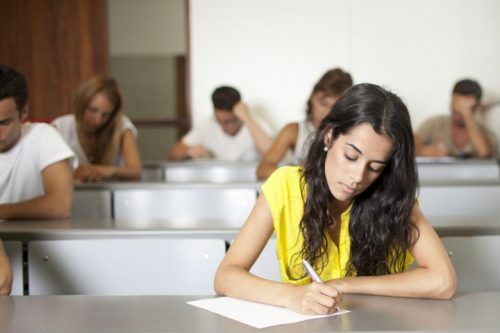 According to U.S. News & World Report, the GRE General Test is a standardized exam used to measure whether students are academically ready and willing to complete graduate school. There’s a general skills test and a GRE Subject Test that measures skills in relation to a specific subject, such as physics, psychology or mathematics. Universities that require students to submit GRE scores during admissions are likely looking for factors that distinguish students from one another. It’s especially helpful when admissions faculty are going through applications and find that students have similar undergraduate backgrounds. In this case, the GRE scores can be used to differentiate these individuals. Why doesn’t Hofstra Law require the GMAT or GRE for the Health Law and Policy programs? For the Master of Arts in Health Law and Policy program, you need a bachelor’s degree from a regionally accredited institution. Submit official law school transcripts and TOEFL reports directly to the Maurice A. Deane School of Law at Hofstra University. Students interested in gaining a master’s degree in health law and policy should consider Hofstra Law. Because you’re not required to provide GMAT or GRE test scores for the health law and policy programs, you don’t have to stress about taking either exam and relying on your scores to get into the school. Instead, you can focus on gaining work experience and improving your resume to impress admissions faculty and staff. Furthermore, both health law and policy programs are 100 percent online. With the flexibility and option to learn at your own convenience, you can continue working while furthering your education. This can help you advance your career and place you at the forefront of the industry. Visit the program page to find out more about earning an online Master’s in Health Law and Policy.